This article will review weight-training, more accurately known as "resistance-training." Since there is so much information on this topic, the discussion will be divided into 2 separate parts: Part 1 will cover the basics. Part 2 will address more advanced theories and principles. In these discussions, the term "strength-training" will not be used since working out with weights (or other forms of resistance) increases not only muscular strength, but improves muscular "endurance" and muscular "size" as well. First, note that weights (barbells, dumbbells) and weight-machines are not the only way to provide resistance. Resistance can be generated with springs, rubber bands, or exercise machines like Bow-Flex(tm). Resistance training can also be achieved by using your body weight (for example, pull-ups, push-ups, dips, squats, and sit-ups). Even isometric exercises produce increases in strength. In fact, using barbells isn't even an option for some exercises: push-ups, pull-ups, sit-ups, dips. To add resistance to these exercises, consider wearing a weighted vest. Some can hold anywhere from 1 to 84 pounds of weight. Resistance can be added to running and biking, too. It just requires a little creativity. Everyone knows that running or biking uphill is a lot harder than the same activity on a level surface. Some athletes add resistance to their running program by pulling a parachute or a weight sled behind them. • Intensity and Volume: "intensity" is the amount of weight lifted; "volume" is calculated from the amount of weight lifted and how many times that weight is lifted. • Muscular Endurance: generally reflects how long a muscle can work before becoming fatigued. • Muscular Strength: determined by the maximum amount of weight that can be lifted once. The 1-RM value is a measurement of muscular strength. • "1-RM": stands for "1 repetition maximum." The most weight you can lift one-time-only is your "1-RM" for that exercise. So, if you can only bench-press 120 lbs once, then your 1-RM for that exercise is 120 lbs. If you can bench-press a particular weight 8 times in a row (but no more than that), then that weight is known as your "8-RM". Thus, as you progress from 8-RM to 6-RM to 4-RM, the amount of weight increases. Note that your 1-RM typically differs for each separate muscle group. • Straight Sets: the "standard" weight-lifting workout: a number of reps followed by a rest period, then one or more sets of that same exercise. • Super Sets: a set of each of two different exercises performed back-to-back without resting between each one. • Tri-Sets: Three different exercises performed one after another, without any rest in between. • Drop Sets (aka, descending sets): Three or four sets of one exercise performed without rest, using a lighter weight with each successive set. • Circuit Sets: a series of exercises (usually 6) that are completed in succession without rest. Next, let's discuss the concept of adaptation. The concept of a "general adaptation" response as it pertains to human physiology was first proposed by Hans Selye, MD, PhD. During his second year of medical school (1926), he began developing his now-famous theory of the influence of physiologic stress on the body's ability to cope with and adapt to the pressures of injury and disease. He discovered that patients with a variety of ailments manifested many similar symptoms, which he ultimately attributed to their bodies' efforts to respond to the stresses of being ill. He called this collection of symptoms "stress syndrome," or the general adaptation syndrome (GAS). Today, we know that the human body has an amazing capacity to adapt. And this can be demonstrated in terms of fitness, too. For example, when subjected repeatedly to strenuous aerobic exertion, a myriad of changes begin to occur in the cardiovascular system. Stroke volume increases tremendously and capillary growth is stimulated to help deliver more oxygen to muscles. These 2 factors in turn lead to a decrease in resting heart rate since the efficiency of oxygen uptake by skeletal muscle is improved. Metabolic adaptations occur, too. The body gets more efficient at utilizing not only oxygen, but also, carbohydrates and fats for energy. The sweating reflex becomes more efficient if you train in hot/humid conditions. Training at an elevated altitude stimulates red blood cell production to compensate for the lower amount of oxygen in the air. These changes take several weeks to months to develop. Each of the above examples qualifies as "physiologic stress." It is important to think of stress in this case as neither positive or negative, but, rather, as simply a "challenge" to the status quo of a particular system in the body. The "general adaptation response" also applies to resistance training. It seems like such a simple concept: Muscles get stronger as a result of being forced to contract against higher amounts of resistance. However, when weights are used to produce increases in strength, variables such as how much weight you lift and how many repetitions you do can yield vastly different results. A 17-year-old, 180-lb high-school football player can bench-press more than a 44-year-old 200-lb full-time carpenter. How is it possible that a teenager is actually stronger than a grown man who does physical labor all week long? The answer lies in 2 explanations: (a) specificity and (b) the amount of weight each person "works out" with. Even though both men are doing exercises that challenge their shoulders and upper arms, and, even though the carpenter may swing that hammer 1000 times per week, the hammer weighs less than 2 pounds. The high-school football player, however, regularly performs bench press exercise with 150 lbs on the barbell. So, in this case, the "intensity" of exercise for the carpenter is extremely low. Second, muscles respond in a very specific way. The motion of swinging a hammer is much different than the motion of the bench press. Yes, both "exercises" require contraction of the triceps muscle, but that's where the similarity ends. Pounding nails with a hammer involves movement more like a triceps extension, whereas the bench press requires substantial contribution from the deltoids and pectorals as well as the triceps. Thus, if we put both men on the bench-press and assessed their 1-RM, the high school football player would likely record a higher value (assuming the high-schooler had been practicing the bench press for at least several weeks prior to the test). If, however, we measured forearm (grip) strength, we might find that this muscle group is much stronger in the carpenter than the same muscle group for the high-school football player. Here again, the explanation is specificity of exercise. Swinging a hammer requires a tremendous amount of forearm strength (and muscle endurance). The bench press does not really challenge the forearm muscles in the same manner. So, specificity of exercise is important for building muscle strength. This brings us back to Hans Selye's concept of overload. Regardless of whether we are talking about males vs. females, old subjects vs. young, endogenous testosterone levels, or grams of protein in the daily diet, the #1 most important factor in developing muscular strength is the amount of resistance (ie., the amount of weight lifted). When a muscle is repeatedly forced to contract against resistance, it responds by getting stronger. So, somewhere between a 2-lb hammer, and a 1000-lb barbell, is the "magic" weight that stimulates muscle strength to increase. According to William Kraemer, PhD, that magic weight lies between 50% and 100% of the 1-RM for a given muscle group (Kraemer WJ. 2003). So, how are 1-RM values determined? One method that is NOT endorsed is to load up a barbell with the most weight you have ever lifted and see if you can lift that weight once. Not only do some health clubs prohibit this, but you can get injured. For example, if you can bench-press 120 lbs five times in a row, then your 1-RM for the bench-press is 135 pounds. This formula is known as the Brzycki equation (Brzycki M. 1993). At least 11 different equations have been derived to calculate 1-RM, but the Brzycki equation is regarded as very accurate (Mayhew JL, et al. 1995). Other equations are also good, however the validity of all of these equations (for predicting 1-RM) is best when the number of repetitions is kept low (Mayhew JL, et al. 1995) (Whisenant MJ, et al. 2003). While your personal 1-RM values might be worth bragging rights, the real purpose for knowing these limits for each exercise is to have a basis for designing your training regimen (see below). There is more to lifting weights than simply picking up a barbell and trying to lift it as many times as you can. Serious body-builders and weight-lifters often have elaborate regimens that they follow. a) know your 1-RM value for each exercise. b) decide whether you want to build strength and power, strength and size, or muscular endurance. To maximize increases in strength, use higher weights (eg., 8-RM to 4-RM) and perform fewer repetitions. To increase muscular endurance, generally you would do the opposite. • Resistance exercise for the back: Stuart McGill, PhD, a professor at University of Waterloo in Ontario, and a leading authority on back pain and rehabilitation, points out that, to rehab the back muscles, the best strategy is to use a low amount of weight and a relatively high number of repetitions. For example, in a Norwegian study, the exercise program had subjects perform 2-3 sets of 20-30 reps for each back exercise (Torstensen TA, 1998). In the back exercise study, subjects performed as many as 90 reps per exercise. But, in the cycling study, subjects performed no more than 20 reps per exercise. This illustrates how resistance-training programs can be designed to develop muscle endurance (eg., low weight with high number of reps) or muscle strength and power (eg., heavy amounts of weight with a low number of reps). • Bent-Over Rows: Bending forward at the waist and doing rows with a barbell puts an enormous strain on the back. Instead, use a single dumbbell and exercise one side at a time so that you can place your free hand, and your knee on that free side, on a bench. This way, your spine is supported like a table with 3 legs. • Seated Leg Press: Even though this exercise machine exists in virtually every gym, some experts recommend not doing a leg press in this manner. Why? Because this seated position causes you to shift weight directly to the tiny bones of the tip of your spine (your tail bone) which may injure them. Instead, do a standing leg press...with a spotter! For more exercises to avoid, see: Bad Exercise. • Never attempt to lift heavy weights over your head, or bench-press without a spotter. • A good starting weight is one that allows you to do 12-20 repetitions. You can then build up from there. With each exercise, you should attain momentary muscle failure after about 30-90 seconds. • Emphasize slow speed (about 4-5 seconds per repetition) and proper form over trying to lift higher amounts of weight. • Work the larger muscle groups (back, chest, thighs) first, then progress outward to smaller muscle groups (biceps, forearms, calves). • Alternate "pushing" exercises with "pulling" exercises in each session. For example, combine squats (pushing) with hamstring curls (pulling); combine bench press (pushing) with rowing exercise (pulling). • Weight-training for strength: Increase the weight of each lift and decrease number of repetitions. Begin with a weight that brings you to momentary muscle failure after 8-12 repetitions. • Weight-training for muscle endurance: Decrease the weight and perform a higher number of repetitions (ie., 12-20 reps). • Protect your knees: Do not do squats or leg-press exercises where you allow the knee joint to go past 90-degrees. When doing lunges, do not let your knee extend forward farther than the foot (on the same leg). • Protect your shoulders: Do not do fly exercises where you let your elbows drop below the level of your chest. • Protect your back at all times: Refrain from lifting any amount of weight by bending at the waist and lifting with your back muscles. When doing bent-over rows, use a dumbell instead of a barbell and exercise one side at a time. For example, if you are lifting with your right arm, support your spine by placing your left hand and left knee on a bench. These issues are covered in detail in other reviews (see Articles). • If you want to build strength, first determine your 1-RM and calculate a training regimen from that value. Reassess your 1-RM periodically and adjust your training regimen accordingly. • If you want to improve your muscular endurance (cyclists, rowers, tennis players, etc. ), then use less weight and more repetitions. • Use good form, protect your back and your knees, use a spotter when necessary, and don't ignore rest periods. • Building Strength & Stamina (Human Kinetics, 2003) by Wayne Westcott, PhD. Dr. Westcott has been publishing quality texts on strength-training for over 20 years. • Fitness Weight Training (Human Kinetics, 2005) by Thomas Baechle, EdD, and Roger Earle, MA. • Strength Training For Women (Human Kinetics, 2005), by Lori Incledon, may be helpful to women who are less experienced with resistance training. As your resistance-training program evolves, consider this book: New Functional Training for Sports, 2nd ed (Human Kinetics, 2016). 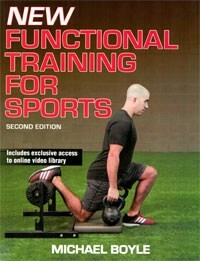 Trainer Mike Boyle presents resistance exercises that I haven't seen in other books. A variety of resistance-training gear can be found here: Resistance-Training Gear. Baechle T, Groves B. Weight Training: Steps to Success, 2nd ed., 1999, Human Kinetics, Champaign, IL.